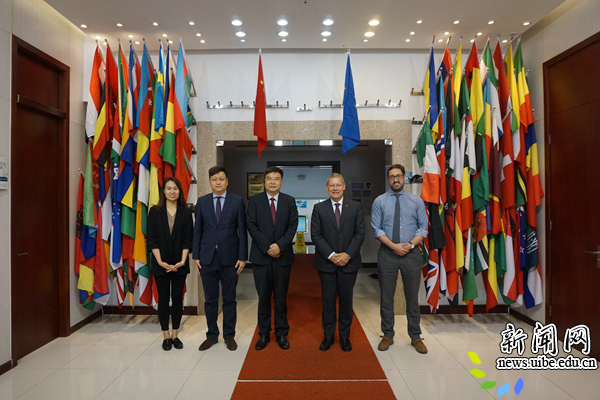 François Genisson, head of unit for inter-institutional relations, international cooperation & strategy of the EU's Directorate-General for Interpretation (SCIC), visited the University of International Business and Economics (UIBE) in Beijing on June 29, 2018. Vice president Zhao Zhongxiu of UIBE met Genisson. Zhao thanked SCIC for its support of the development of UIBE’s international conference interpretation major for many years. UIBE’s China-Europe Advanced Interpreter Training Center has become a top program for domestic college interpreting majors in recent years. The university would expand its cooperation with the SCIC in scale to cover more languages, said Zhao. Genisson said the long-term cooperation between SCIC and UIBE could promote the cooperation between the EU and China in various fields.